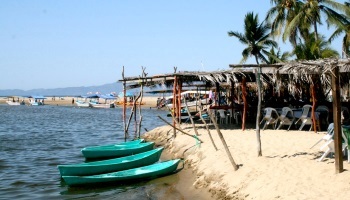 Zihuatanejo's bay offers safe haven from storms and is a favorite for boating and all types of water sports. Contained within the bay are 5 main beaches: La Playa Principal (located in front of the town "Centro" itself), Playa La Madera (a 5 minute walk from town), Playa La Ropa (5 minutes from town by car, or about a 20 minute walk. Wear comfortable shoes. ), Playa Las Gatas (at the extreme southern end of the bay; accessible by water taxi from the pier, or via a footpath along the scenic coast from La Ropa. There is no road), Playa Contramar (at the northern end of the bay: accessible by boat or footpath). Not only do we have some of the most beautiful beaches in Mexico, but some of the most beautiful in the world! The main beach for swimming and water sports is Playa La Ropa. This perfect beach is about a mile long with, usually mild waves making it perfect for swimmers and non-swimmers alike. It's usually possible to body surf the 1 to 3 foot waves there on a normal day. If you like snorkeling then Playa Las Gatas is ideal whether you're a beginner or an old-hand; it has a reef that forms a haven from the waves, although surfers can sometimes be seen catching waves as they curl around the entrance to the bay. Las Gatas has over a dozen restaurants specializing in seafood, so it can be a little confusing trying to decide where to throw your towel. Near the beginning of the beach is a great little place called "Chez Arnoldo" where my friend Noyo and his family run a tight ship! 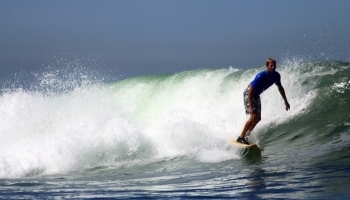 The waves are usually good for bodysurfing at Playa La Madera where you can wade out quite a distance before reaching the breaking waves. There is a waterfront walkway from the Playa Principal that passes several small picturesque coves, although you still may have to get your feet wet due to the surf splashing against the walkway. La Playa Municipal is the beach in front of downtown Zihuatanejo. At one end there is El Muelle Municipal (the Municipal Pier) where you can catch a water-taxi to Playa Las Gatas or charter a fishing boat, and at the other end is El Museo Arqueológico de la Costa Grande where you can learn about local pre-Columbian history. Playa Contramar is a beautiful place to snorkel but the beach is made up of surf-polished rocks and not sand. It's recommended to go there by boat and take a lunch. There is no reliable restaurant there but the coral and rock formations underwater are well worth seeing (look for the tunnel!). The main beach in Ixtapa is called Playa El Palmar and if you like a beach lined with high-rise hotels then this is for you. There is a smaller somewhat secluded beach fronting the Westin Hotel called Playa Vista Hermosa which is semi-private and accessible through the Westin.